I’m so excited about today’s recipe that I almost can’t sit still! I’m crazy about potatoes, any way you make’m, so I have collected a vast amount of potato recipes over the years. I didn’t think it was possible to top them – you see, I figured I had already found and perfected the best of the best recipes out there. It turns out I was wrong, and I’m actually really happy about that! I came across this caramelized roasted potatoes recipe on Vegan Food Lover’s channel, and it is TO DIE FOR. Honestly, I could eat these potatoes seven days a week and twice on Sunday! Vegan Food Lover really has found a heavenly combination of ingredients for that marinade – and I didn’t even realize you could marinate potatoes! I highly recommend checking out all of his recipes; that’s what I’ve been doing for the past couple of days, and I’ve found quite a few favorites already. Let’s just say I’m going to pamper my family with these incredible dishes for the next couple of weeks, and you all should do the same! These caramelized roasted potatoes from Vegan Food Lover are a staple in our dinner routine now, and trust me – I make them often! I could probably live on these alone for a few weeks and I wouldn’t even miss any of my old favorite recipes! If you haven’t taken a look at Vegan Food Lovers recipes yet, you should really do it now. My daughter said these taters were better than the ones she had at her favorite restaurant, and I believe her. These are amazing! 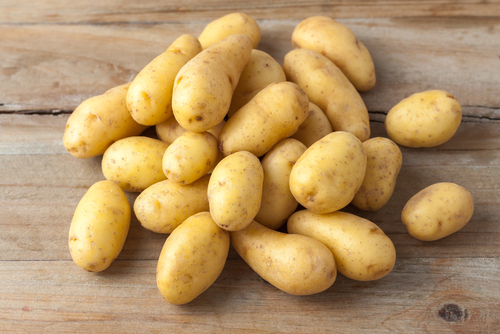 Wash your potatoes thoroughly and chop into big chunks. Bring a pot of light vegetable broth to a boil. If you don’t have veggie broth, plain water is fine. Add a few dashes of salt, then add the potatoes. Cover and let simmer on medium heat for 10 min. Drain the potatoes and set them aside in a colander. Fill a deep, heavy bottom pan or casserole dish with 1/4″ of vegetable oil. Be sure to use an oil with a high smoke point, such as peanut oil, avocado oil, or refined sesame oil. We used the latter. Place the oil in the oven for 5 min at 425º F.
Remove the oil from the oven and place the parboiled potatoes in it. Use a pair of tongs to turn the potatoes and evenly coat them in oil. Put the pan back in the oven on the top rack for 30 min. While the potatoes are cooking, start on the marinade. Add all ingredients to a blender and process until evenly mixed. 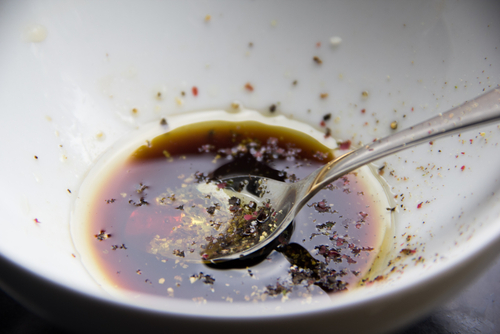 Transfer marinade to a bowl and set on the stove top until ready to use. Remove the potatoes from the oven, and in a separate bowl, toss them in the marinade. Transfer them back to the pan, and put them in oven for another 15 to 20 min, or until dark golden brown. Toss the potatoes one more time in the left over marinade, and then transfer to a serving dish and sprinkle with salt and pepper. Quick tip: Don’t let the tanginess of the fresh marinade scare you; when the potatoes are cooked, the flavor is perfect! Recipe and image courtesy of YouTube and Vegan Food Lover – check out his great how-to video!